Salah satu fitur terbaru dari AppManager adalah ADDM. Dengan ADDM maka kita akan dengan mudah membuat relasi dan map aplikasi. Dan tentu saja melihat statusnya terkait dengan bisnis kita. To track dependencies, IT infrastructure has relied on conventional techniques such as endless spreadsheets and extensive audits. But the proliferation of virtualized data centers, cloud, and micro services, has made it increasingly difficult to track dependencies using these archaic methods. Now, application maps are usually the first step to visualizing complex IT environments. 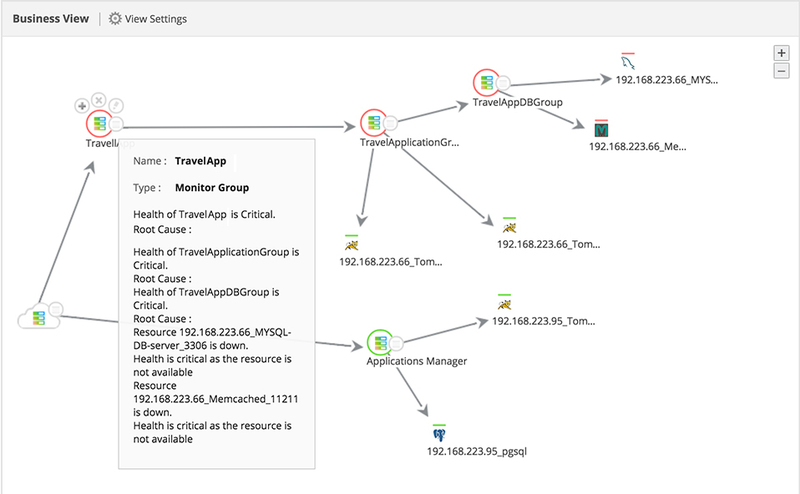 With ManageEngine Applications Manager's new Application Discovery and Dependency Mapping (ADDM) feature, you can get a complete view of your complex IT infrastructure, easily drill down to IT relationships, and map them effortlessly! 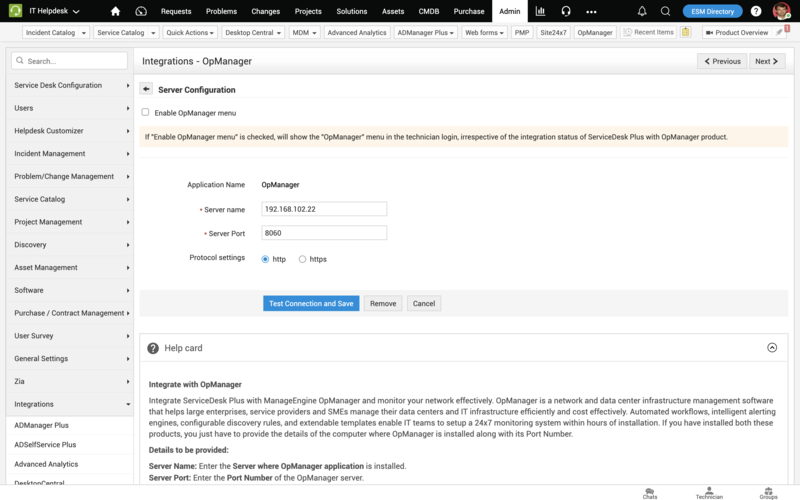 Use Applications Manager to discover all the resources (storage, network, applications, servers, and databases) in your IT environment. 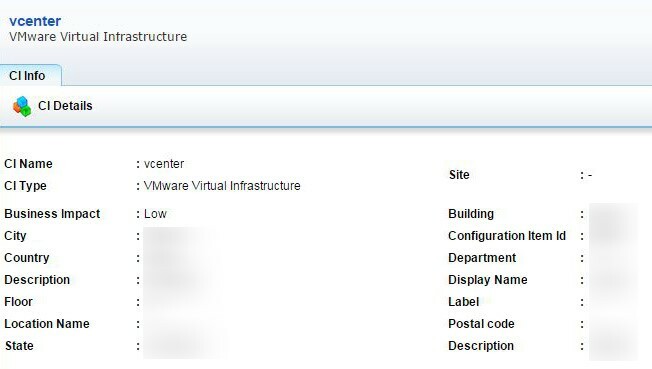 The vCenter server allows you to discover resources in your entire VMware virtual infrastructure, or you can specify an IP range to discover all resources within that range. You can also schedule periodic re-discoveries to stay updated about new resources. Design a business service dependency map. Create business service groups, and let the ADDM feature automatically associate all discovered resources to the desired group. Gain a global view of all discovered applications, from web services to URLs. View the connections and dependencies among applications and their relationship with the infrastructure, as a whole. 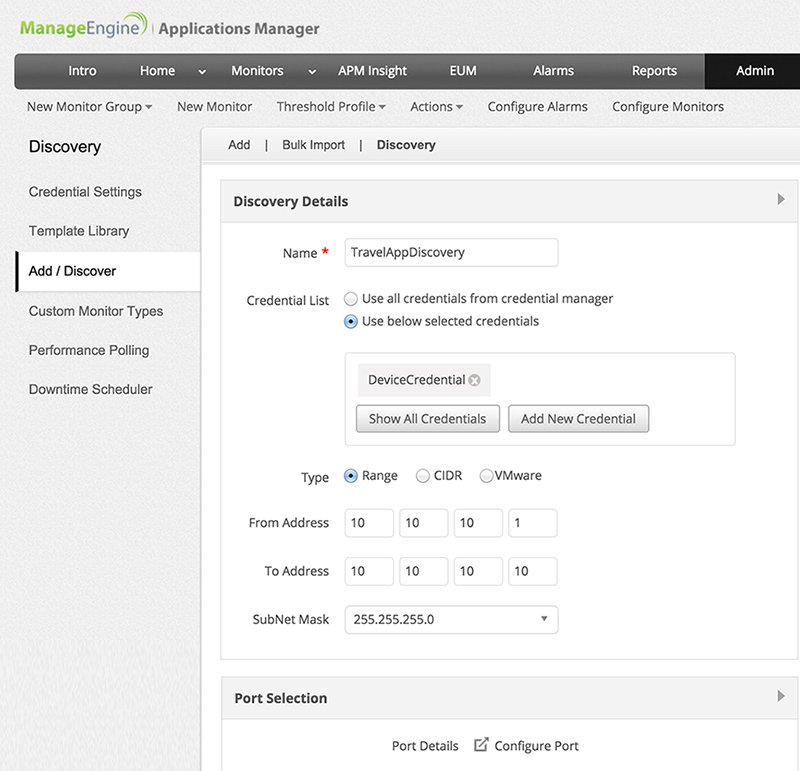 View the status of applications, and troubleshoot quickly. The business view displays all the connections between various associated components in the IT infrastructure. This way, you can view the components associated with a particular application and quickly locate faulty devices, instead of having to browse through the entire infrastructure. Once the issue is diagnosed, you can troubleshoot accordingly. CMDB integration and updates made effortless. Learn the underlying components of your IT environment, and how they are connected. Further, you can place these components and their dependencies in the CMDB of ServiceDesk Plus, so that they become configuration items (CIs). 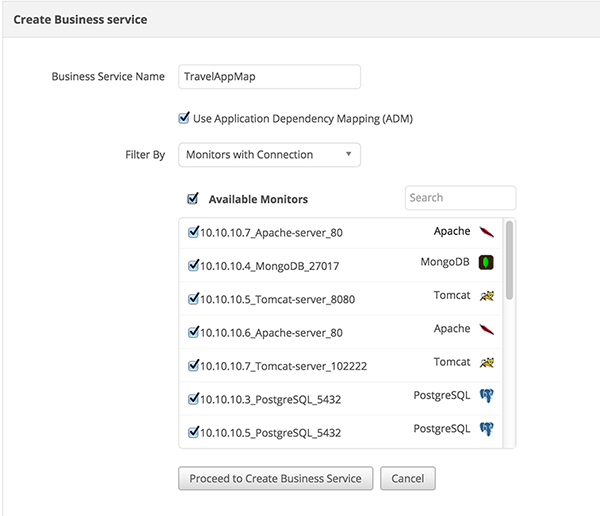 Map accurate CIs to your service management processes with CMDB integration, and be informed of the impact of configuration changes and planned downtimes, all from the relationship maps. The CMDB is automatically updated with the ADDM module. All in all, this feature gives you everything you need to know about your IT environment, in one place. Actionable Service Catalog: A service catalog is an organized and curated collection of any and all business and information technology-related services that can be performed by, for, or within an enterprise. An actionable service catalog enables self-service and a user can request for the services on demand. To maximize the value of automation, it should be exposed to users as services and positioned in the enterprise service catalog. Care should be taken to make sure accessibility and security of the service is taken care by exposing the services to appropriate users or user groups. Service Asset and Configuration Management: One of the most critical integrations for automation with respect to ITSM is with the CMDB and AMDB. Having the CMDB up to date at all times is important and automation should take care of the same, and not just focus on the physical object. Integration also results in improved accuracy as the CI details and asset details that are used in the automation library are sourced from the CMDB which is the approved repository. IT Financial Management: IT as a business is no longer a buzzword. And having an integration between IT Automation and IT Financial Management enables service or portfolio owners to drive demand behavior and also provide monthly chargeback reports easily. A mature service cost model will be needed to appropriately determine the price of an automated value flow. Change and Release Management: One perspective is that ITIL is aligned with change management. Release management is limiting automation due to its emphasis on processes and procedures. However, change management is extremely important and automation should not bypass the same. Change tickets need to be opened from automation and from an audit or compliance perspective, each and every automation request that changes a state of a production CI needs to have an associated approved change ticket. Service Reporting and CSI: Automation is not a one-time initiative. It is best implemented in phases and performed incrementally to achieve the CSI spiral. ITSM tools and enterprise BI tools need to be integrated to provide the much needed service assurance dashboard to enable automation/service managers to keep track of automations and govern them successfully. Speed and agility are the essence of automation and automated service reporting is needed to ensure accuracy of fulfilled automation requests. The CSI program and the governance process should be extended to automation, to ensure scalability and sustainability of automation in enterprise IT. Achieving and maintaining a successful Help Desk operation can depend on a number of pre-requisites that need to be in place. These components have been identified from surveys covering a wide range of help desk facilities. This unit is particularly key within the Help Desk structure. The front line personnel are the first people that the customer will contact in the event of a problem or incident. Their job is to record accurate information regarding the problem or incident, and to make an initial assessment of the classification level to be assigned to the problem. The front line support staff will then either identify potential solutions to the problem, or refer the matter directly to level two or level three support staff. The second level support unit is usually staffed with a higher level of technical or specialised skills than the front line unit. The second level support unit is often located within the Help Desk premises, although this is not a mandatory requirement within this structure. Usually staffed with highly technical specialists who will assess and advise the customer of the anticipated time for the resolution of the problem or incident, and then resolve the problem. Recent studies have shown that over 60% of Help Desk organizations have inadequate Information Security Policies and, as a result there is an inadequate basis upon which to build the appropriate safeguards to protect the life blood of the Help Desk � its information systems. You should research and obtain suggested baseline policies and rules to be applied to meet these requirements. Your organization should adopt only those policies that meet their own requirements and the organisation�s risk profile. Whilst Information Security Policies lay a solid foundation for the development and implementation of secure practices within your organization, the Policies themselves are not usually instructional or overly descriptive. They represent the rules which must be adhered to by the organization. Compliance will require an understanding by staff of not only the individual policies but also of the circumstances in which such compliance is expected in their day-today activities. Knowing the Policies is only one half of the equation - staff need to know how they should comply, from a procedural perspective. It is necessary to monitor staff utilization and this is achieved through workload analysis. It is important to measure both average utilization and also peaks and troughs and monitor the periods in which they occur. If change management is not standardized then changes are likely to occur in an uncoordinated and uncontrolled manner. The main goal of problem management is in the detection of the underlying reasons for a particular incident and the resolution and prevention of future recurrences of that incident through problem elimination methodology. Effective problem identification is dependant on a formal incident management process. In the first instance the emphasis should be on problem and error control processes, particularly where specialized resources are in scarce supply. On a regular basis the service quality levels need to be reviewed with the customer. This is normally handled by holding periodic service review meetings between the customer�s representatives and Help Desk staff or other supplier representatives nominated for this task. These meetings can be at regular intervals or they can be triggered by a significant problem experienced by the customer or simply because the customer has requested a meeting to discuss concerns that they may have. The key document to form the basis of these meetings is the service level agreement and these meetings will tend to use this document as a basis for discussing service expectations and actual delivery. At these meetings it is important to discuss whether the services being delivered are in full conformity with the agreement and whether any deviations that have occurred that need to be rectified. Automatically Convert Network Alarms into Tickets. Restore Services Sooner. Convert network alarms from OpManager into tickets in ServiceDesk Plus, with a simple email trigger or API level integration. Notify your IT help desk technicians of any network outages, alarms, and subsequent ticket creation in ServiceDesk Plus. Automate the process of categorizing, prioritizing, and assigning tickets to technicians based on predefined error conditions. When the outage is resolved, automatically close incidents created in ServiceDesk Plus. Today's information architecture relies heavily on databases. Whether you use Microsoft SQL, MySQL, PostgreSQL, Oracle SQL or MongoDB—the health of your database server is an essential value to monitor in order to guarantee fast and reliable database access. After having already presented the WMI Microsoft SQL Server sensor, in this blog article you'll learn about how you can monitor your MongoDB server with PRTG Network Monitor. Get more operations per second. If you have integrated MongoDB in your IT infrastructure, just take this sensor type for a spin! For more information on how to configure it, just have a look at the PRTG manual chapter on theMongoDB System Health sensor. Let's keep your MongoDB server healthy! Ada hal yang menarik dengan PRTG. Ternyata bisa digunakan untuk monitoring banyak hal,termasuk monitoring Google Analytic, Google Drive, Microsoft OneDrive dan Dropbox, hanya dari layar dashboard PRTG kita.. In February this year, our CEO Dirk Paessler shared some words on how to set up a cloud policy before entering the cloud with you. Since then, eight months have passed and you probably rely more on cloud services than ever before. While the backbone of your productivity still lies within a well working network and especially a functioning internet connection to use said cloud services, including them into your favorite monitoring software seems like the next logical step. With this and the next blog article, I want to introduce the new PRTG cloud sensors to you: They will help you to keep track of the most important values of your cloud services. If you use Google Analytics, you know about its powerful capabilities when it comes to keeping track of your website's data. You can now view the values for all available Google Analytics metrics directly in the sensor's channels. The Google Analytics sensor queries data from your Google Analytics account using the Google API (Application Programming Interface). Just see the Paessler Knowledge Base on where to find available Google Analytics metrics. You want to check unique views, users, or total views? From now on, just have a look at PRTG! When it comes to cloud services, cloud storage is one of the most widely used applications. That's why with the Google Drive sensor we now enable you to monitor your cloud drive's free storage in both bytes and percent as well as the trash size in percent. If you prefer Microsoft OneDrive to Google Drive as a cloud storage provider, just use the Microsoft OneDrive sensor, which shows you free storage in bytes and percent using the OneDrive API. With Dropbox being one of the most popular cloud storage providers, it was a natural choice to incorporate it as one of our cloud sensors. PRTG uses the Dropbox API to show you free storage in bytes and percent. No matter which cloud service you use, make sure you create notifications and add triggers tailored to your specific needs. Just have a look at the PRTG manual on "Sensor Notification Settings" and get started! Stay tuned for the next chapter of this blog series: "PRTG Cloud Sensors - Part 2: Amazon CloudWatch Sensors". Despite being a relatively mature technology, new product capabilities and diverging vendor strategies make selecting a client management tool vendor as challenging as ever for end-user computing and support managers. End-user computing and support organizations use client management tools (CMTs) to automate system administration and support functions that would otherwise be handled manually. CMT image client systems, track inventory, deploy configuration changes (such as software or patches), enforce configuration standards and assist with troubleshooting. Windows PCs are the primary object of management, but organizations often extend these products to manage Macs and even servers. Enterprise mobility management (EMM) is still a separate market, but organizations increasingly look for a single vendor and management platform to support PCs, Macs and mobile devices. Absolute Software's Absolute Manage is a leading product for managing mixed Windows and Macintosh environments. The interfaces, functionality and processes used for management remain consistent, regardless of the type of system being managed. A unique feature of Absolute Manage is its use of Persistence technology, which is embedded in the firmware of most PCs and automatically reinstalls the software agent if it is removed. Absolute Manage does not provide the depth or breadth of management functionality that most large enterprises require, but its ease of use, user interface and price point are well-aligned for small and midsize organizations, particularly educational accounts, where Absolute Manage has enjoyed its greatest success. Absolute Manage is a good choice for small and midsize organizations looking for consistent management capabilities across Windows and Mac at an aggressive price point. Absolute Manage provides consistent management capabilities and tight functional interoperability across Mac and Windows platforms. Persistence technology provides strong agent health and hardware inventory management capabilities. Absolute Software has been slow in providing some client management capabilities that organizations are increasingly requiring, such as the availability of a software title database. Relative to other vendors, Absolute Software's customer base is small, and awareness for Absolute Manage is relatively low, particularly for Windows. The vendor also lacks a strong online community and user groups. Client Automation, which Accelerite acquired through a licensing agreement with HP, is an enterprise-class product that offers deep levels of management functionality, scalability and strong capabilities for managing remote locations. An ongoing focus for Accelerite is to provide a unified solution incorporating different management offerings within its expanding portfolio of products. Accelerite's goal with Client Automation is to protect and expand its installed base of large enterprises, while at the same time penetrating the midmarket. This will prove to be extremely challenging, given the vendor's limited sales, marketing and support resources. Client Automation is a good fit for organizations experienced in client management that do not require high levels of service and support. Accelerite Client Automation has a highly scalable underlying architecture that is particularly strong at managing remote locations. Accelerite is one of the few vendors in this Magic Quadrant that can deliver a consistent set of a client management functionality on-premises, as a SaaS-based cloud offering or through a managed service provider relationship. Accelerite is a small vendor with limited sales and marketing capacity that must quickly grow share in the midmarket, while preserving its enterprise business. The feature set of Accelerite Client Automation is more geared toward larger enterprise requirements, and midsize organizations may not be able to exploit its full capabilities (e.g., scalability and remote-office management). BMC Software offers one of the broadest portfolios of operations and management tools in the market. BMC Client Management (BCM), its CMT targeted at midsize businesses, is sold mostly as an add-on module to other BMC products, most frequently its small and midsize business (SMB)-focused IT service management solutions. BCM offers a good set of basic client management functionality, an intuitive and easy-to-use interface, and strong integration with other BMC Software products. BMC Software is one of the few CMT vendors without a mobile management offering of its own, and invests only minimally in promoting BCM. This raises concerns about the strategic nature of client management as a stand-alone business. BCM is a good choice for users of other BMC Software management products, such as the vendor's IT service management offerings, and especially for those looking for tightly integrated solutions. BCM uses a simple user interface, making it accessible to IT staff that lack substantial desktop administration expertise. BCM has tight integration with BMC FootPrints Service Core and BMC Remedyforce Service Desk, at a console, data and process level. The absence of an established mobile management offering product will hinder the vendor's ability to provide a unified endpoint management solution. As a stand-alone offering, compared with other products in its portfolio, client management is not highly strategic to the overall success of BMC Software, and receives minimal sales and marketing focus, resulting in low market penetration and a weak community of users. CA's Client Automation CMT is noted by its users for its stability and code quality. CA's client management focus in recent years has been on providing management capabilities for desktop virtualization technologies, as well as providing an integrated EMM tool. CA's visibility in this market continues to decline, with few Gartner clients considering Client Automation. Nevertheless, Client Automation is a good fit for organizations looking to manage hosted virtual desktop environments and physical desktops in a single tool, especially for customers of other related CA products, such as IT Asset Manager and Service Desk Manager. Client Automation allows administrators to manage physical and virtual desktops similarly with features such as the ability to maintain application assignments for dynamically assembled desktops for VMware View and Citrix XenDesktop. The product has strong software inventory management, providing multiple ways to identify software, including a unique capability called Intellisigs, which allows administrators to identify software more accurately than heuristics or signature-based methods. Relative to other vendors, Client Automation has low visibility in the market, and is usually not considered unless part of a larger CA bundle or as an add-on module. Client Automation lacks a strong online community and user groups. The Dell Kace OS deployment (K2000) and life cycle management (K1000) appliances offer a strong breadth of management functionality, highlighted by ease of use and setup. Dell released version 6.3 of K1000 earlier this year, which added several targeted features (such as Chromebook support). The vendor has successfully been leveraging its large, global sales organization to increase exposure of Kace within new and existing opportunities, and is making available a free, scaled-down version of the agent for all Dell and non-Dell business laptops and PCs. Dell also discontinued the mobile management (K3000) appliance, and is now focused on integrating mobility management into the K1000. Mobility management is an area in which Dell continues to lag behind other management vendors. Kace is a good fit for organizations that want a product that is easy to deploy and easy to use, and it is particularly well-suited for midmarket, educational institutions and enterprises that may not have the resources or expertise in client management. The Dell sales force, which is actively promoting Kace and offering access to the technology integrated with other Dell hardware, gives it a unique sales channel with broad and geographically diverse capabilities. Kace appliances are easy to deploy, maintain and upgrade, which are among the major challenges of CMTs in the midmarket. Kace has lagged behind other market-leading CMTs in enabling new functionality and capabilities, particularly in addressing the requirements of larger organizations. Kace is now part of Dell's rapidly expanding software portfolio, and must share focus and investment with other high-profile, high-margin offerings. FrontRange was sold to private equity firm Clearlake Capital in February 2015, where it was combined with Lumension, a security and patch vendor, to create a new entity called Heat Software. Heat Desktop & Server Management (DSM) is an easy-to-use client management product regularly bundled with other FrontRange solutions. The majority of Heat DSM's revenue is generated by European customers today; Gartner has yet to see broad-based adoption of the product in North America or Asia. A goal of joining with Lumension is to allow Heat Software to expand its customer base globally over time. Heat DSM offers a good balance of easy-of-use, wizard-driven functionality for less experienced users, and more advanced functionality, such as scripting, for users more experienced with client management. Heat DSM is a good fit for midsize organizations, especially those looking for a bundled set of management offerings. Package building has long been a differentiator for Heat DSM. Many client management offerings require third-party products for advanced application packaging, but DSM includes strong native capabilities to help customers build packages. A combined FrontRange and Lumension will allow Heat Software to improve on patch management and overall security capabilities within Heat DSM. Heat Software's visibility and presence in the CMT space is low. Organizations may have difficulty finding online peer support, as well as administrators and consultants with Heat DSM experience. Heat DSM's console must be enhanced to improve overall performance and breadth of native management functionality. IBM BigFix (formerly IBM Endpoint Manager) excels in patch management, multiplatform support and overall scalability. Organizations also frequently use it to manage servers, particularly midsize organizations that prefer a single tool to manage PCs and servers. During the past year, IBM has been heavily focused on more deeply integrating its enterprise mobility solution and lightweight PC management platform, MaaS360, with BigFix, and enhancing its cloud-based device management capabilities. BigFix is a good choice for organizations that are heavily focused on security configuration management (including patching), and those that require strong multiplatform server management in addition to client management, or scalability to support tens of thousands of endpoints. It is not as good a choice for organizations that require simple usability or that lack strong management tool resources. The product's endpoint-oriented intelligence and control, along with its relay server architecture, results in a relatively small server footprint to support highly distributed environments. IBM BigFix provides comprehensive out-of-the-box configuration policies and templates. Uptake of OS deployment (OSD) remains low, and IBM's track record of supporting it at large scale is unproven. IBM's customers frequently express challenges with support. Client feedback suggests that support for non-Windows management functionality is not as strong as support for Windows-management functions. Landesk Management Suite (LDMS) is one of the most complete CMTs in the market, but the additional capabilities can also make it complex to use. To address this challenge, Landesk is incorporating Workspaces into LDMS. Workspaces are redesigned consoles optimized for ease of use and functionality specific to a user role (e.g., IT analyst, service desk analyst, asset manager and security administrator). A main goal is to allow Landesk to more deeply penetrate markets other than enterprise, where it does the majority of business today. Landesk also continues to focus heavily on promoting its Total User Management Suite, which makes up only a small portion of the vendor's sales today; however, momentum for user-based management and licensing is growing. LDMS is a good fit for organizations that require multiplatform support, robust management and flexibility to customize management tools. Landesk offers one of the most robust sets of management functionality among all client management vendors, with strong cross-device and cross-platform support for Windows, OS X and mobile. The LDMS Targeted Multicast with the peer download option enables administrators to distribute applications using a peer-to-peer model at subnets. Landesk customers have fewer remote package servers than customers using competitive products. LDMS can be complex to use, and generally requires experience with and a strong understanding of client management to fully exploit all of its capabilities. Landesk's EMM capabilities are less mature than its PC management capabilities, and integration with LDMS needs to be tighter. ManageEngine Desktop Central is an easy-to-use, cost-effective client management product aimed primarily at small and midsize organizations that are heavily standardized on Microsoft Windows. The majority of Desktop Central's revenue is generated from subscription licenses delivered to organizations with fewer than 500 users. Desktop Central's functionality is intuitive, offers a wide breadth of basic management capabilities and is one of the most aggressively priced products available in this solution market. ManageEngine made improvements to Desktop Central during the past year, but the product still lacks depth of functionality in several areas (e.g., effectively managing non-Windows platforms, security and vulnerability scanning), and does not scale effectively to meet the requirements of large enterprises. ManageEngine is a good fit for small and midsize organizations seeking basic functionality for managing Windows environments at lower price points. Initial setup and configuration of Desktop Central is straightforward. The interface is intuitive and easy to navigate, and it does not require high levels of client management experience. Desktop Central is one of the most aggressively priced products in the client management space. Desktop Central offers basic management functionality, but trails the market in several key areas, including self-service, enterprise scalability and OS deployment. ManageEngine is still small and not as well-known as many of the leading CMT vendors; as such, it has a limited following and limited online community resources. Matrix42's strategy is to provide workspace management, combining client management, SaaS application provisioning IT service, license management and EMM capabilities (through the recent acquisition of Silverback). Matrix42 has always had a strong focus on emerging and future client management requirements. The vendor's challenge is primarily its lack of a presence outside of Europe, where it still does the vast majority of its business. One of the reasons for acquiring Silverback, located in Australia, was to give Matrix42 a foothold in the Australian market and to expand across the Asia/Pacific region. However, given its limited global presence today and the maturity of the client management market, it will be challenging for Matrix42 to grow its client management business outside Europe. Matrix42 Physical is a good choice for European and potentially Australian organizations that manage complex endpoint environments composed of physical PCs, virtual desktops and mobile devices. The vendor provides packaging and scripting capabilities as a cloud service that include more than 1,200 prepackaged software packages. The product has a comprehensive end-user self-service interface, which is independent of the Matrix42 service desk. OS deployment capabilities need to be extended. Matrix42 Physical does not currently support multicast OS deployment, and reference feedback indicates challenges with driver management in some environments. Mac management capabilities are incomplete, currently lacking OS deployment, software usage and patch management. Microsoft continues to maintain the largest market share in the CMT market by a wide margin. Microsoft's licensing strategy of offering System Center Configuration Manager (Configuration Manager) as a part of the Core and Enterprise Client Access Licenses is the main driving force behind this. Microsoft also continues to enable a robust and growing ecosystem of certified third-party modules and snap-ins, which integrate with the Configuration Manager console, allowing Microsoft to present a more complete set of capabilities in competitive situations. Over the past several months, Microsoft has generated a substantial amount of interest in its Enterprise Mobility Suite (EMS), due, in large part, to its integration with Configuration Manager. Microsoft also plans to release a major new version of Configuration Manager in the fourth quarter of 2015. Configuration Manager is a good choice for organizations with strong client management skills, especially those running predominantly Microsoft software. Configuration Manager's scalability has been proven through many large customers. Microsoft has a large ecosystem of software vendors and service providers that support Configuration Manager, due to its large market share. Support for non-Windows PCs is weak. Configuration Manager lacks patch content for most non-Microsoft desktop applications. Organizations must patch most non-Microsoft applications through traditional software distribution or third-party patch management tools. Remote control is frequently supplemented by third-party products, as it lacks advanced security and auditing capabilities offered by third-party remote control tools. Novell ZENworks Configuration Management (ZCM) capabilities are competitive. Its software distribution is strong, offering advanced capabilities for managing application package dependencies and deploying applications to users (rather than merely machines). However, Novell's presence in the CMT market continues to decline. Novell has recently shifted its focus away from selling ZCM as a stand-alone tool for client management and is now offering it primarily as part of its ZENworks Suite, which includes asset management, application virtualization, service desk, and security and disk encryption. ZENworks is a good product, and organizations that are experienced and satisfied with it should have no compelling reason to switch. ZENworks allows desktop applications to be managed dynamically. Applications can be launched taking into account user identity, location, time and other factors, without the need to develop scripts or a separate profile management tool. ZCM has comprehensive software distribution capabilities; complex software distribution jobs can be managed more easily in ZCM than in many competitive products, which may require more scripting or manual effort. Novell does not have a strong brand in this market, and we continue to see few organizations considering ZENworks beyond legacy Novell customers upgrading from an old version of ZENworks to ZCM. ZENworks does not provide vulnerability assessment or out-of-the-box security configuration assessment capabilities. The Symantec Client Management Suite (CMS) is a comprehensive client management product with deep enterprise functionality and flexibility, and a large installed base of customers. However, challenges prior to the October 2013 release of CMS 7.5 have left customers deciding whether to invest further in the CMS platform or to migrate to an alternative product. While the response from customers that have upgraded to CMS 7.5 has generally been positive, others choose to evaluate alternative offerings. This is due, in part, to past product, stability and support issues. CMS is a viable client management alternative today, but organizations should work with Symantec to understand its long-term focus on and investments in stand-alone client and mobile management tools. CMS is a good fit for organizations with strong client management skills looking for advanced management functionality and flexibility to customize. CMS offers great flexibility in managing endpoints; there are many ways to execute the various functions, allowing administrators to tailor the product to processes. Symantec has a large installed base of customers, with one of the largest and most active communities of user groups and online forums. CMS 7.5 can be complex to use and may be challenging for users without strong client management experience to exploit its full capabilities. A weak position in mobile management will make it more challenging for Symantec to succeed with a future unified endpoint management product. We review and adjust our inclusion criteria for Magic Quadrants and MarketScopes as markets change. As a result of these adjustments, the mix of vendors in any Magic Quadrant or MarketScope may change over time. A vendor's appearance in a Magic Quadrant or MarketScope one year and not the next does not necessarily indicate that we have changed our opinion of that vendor. It may be a reflection of a change in the market and, therefore, changed evaluation criteria, or of a change of focus by that vendor. No vendors were added to the Magic Quadrant. Kaseya was dropped from the Magic Quadrant. Kaseya Virtual System Administrator (VSA) is a broad IT operations management platform targeted primarily at small and midsize managed service providers, as well as serving midsize end-user accounts. Earlier this year, Kaseya dropped support for operating system deployment and, as a result, no longer meets the inclusion criteria for this Magic Quadrant. However, it remains a good choice for organizations that do not require operating system deployment functionality, and those that value a single solution for client and mobile management, endpoint security, and service desk through the same console. There are other vendors in the market that Gartner believes provide strong client management capabilities, but that may not be able to meet all of the Magic Quadrant criteria because of segment, product or market focus. Jamf Software is one such vendor. Jamf's Casper Suite client management product is designed specifically for managing Apple Macintosh computers. This sole focus allows the vendor to provide leading functionality specific to managing Mac systems. Jamf may be a good choice for organizations with large populations of Macs or those looking to complement existing capabilities with comprehensive Mac management. Tanium emerged in the last two years, targeting large organizations with globally distributed networks, and challenging many incumbent vendors. Tanium brings real-time endpoint visibility and remediation, which has become increasingly important in today's age of targeted attacks. Tanium is a good choice for organizations that require real-time endpoint visibility and remediation, and are willing to replace or augment desktop engineering processes and tools, which are usually well-entrenched. The Ability to Execute axis measures the CMT provider on the quality and efficacy of the processes, systems, methods and procedures that enable its performance to be competitive, efficient and effective, and to positively impact revenue, retention and reputation. Ultimately, CMT providers are judged on their ability and success in capitalizing on their vision. Other client management functions, such as remote control, security configuration management and software packaging, are included, but receive less emphasis than the core features listed above. Cross-platform and mobile support, workflow capabilities to automate client management processes, and self-service capabilities are also included. Product scalability, usability and administration are also evaluated, as they relate to being able to meet buyers' current needs. Overall Viability: This criterion covers the organization's overall financial health, the financial and practical success of the CMT business unit, and the likelihood that the business unit will continue to offer and invest in the CMT, and will advance the organization's portfolio of products. Sales Execution/Pricing: This assesses the capabilities in all sales activities, the success of the organization in achieving sales goals and objectives, and the structure that supports them. The frequency of appearance on CMT buyer shortlists and the structure, competitiveness and approach to pricing are also considered. Market Responsiveness/Record: This criterion covers the execution in delivering CMTs and updates consistently and in a timely fashion, the agility to quickly meet new market demands and requirements, and how well the vendor receives and utilizes customer feedback. Marketing Execution: This assesses the effectiveness of marketing campaigns and programs for the CMT to influence the market; promote the company, brand and business; increase awareness of the CMT; and establish a positive identification with the product/brand and organization in the minds of buyers and partners. Customer Experience: This criterion covers the relationships, products and programs that enable clients to be successful with the use of the CMT; customer feedback regarding experience working with the vendor, plans to continue working with the vendor, availability and vibrancy of user communities and online forums, general online presence of the vendor, and overall reputation. Operations: This assesses the ability of the organization to meet its goals and commitments. Factors include the quality of the organizational structure dedicated to the CMT, including skills, experiences, programs, systems and other vehicles that enable the organization to operate effectively and efficiently on an ongoing basis. The Completeness of Vision axis evaluates CMT providers on their ability to convincingly articulate logical statements about current and future market direction, innovation, customer needs, and competitive forces, as well as how well they map to Gartner positions. Completeness of Vision provides an aggregate measure of the vendors' likelihood of future success in the CMT market. Market Understanding: This criterion covers the ability of the vendor to understand the wants and needs of CMT buyers, and to translate those into their products and services. Vendors that show the highest degree of vision listen to and understand buyers' wants and needs, and have demonstrated timely inclusion of these capabilities into their endpoint management roadmap. Marketing Strategy: This assesses the overall marketing vision for the vendor's CMT, including messaging, positioning, target markets, portfolio management and roadmap for endpoint management convergence, and how it is communicated throughout the organization and externalized online, through advertising, customer programs and positioning statements. Sales Strategy: This criterion covers the strategy for selling products that optimizes routes to market (e.g., direct versus indirect sales, end-user versus service provider), the strength and bundling of additional offerings (e.g., endpoint security, service desk, asset management), and the pricing and delivery models and how they map to customer requirements. Offering (Product) Strategy: This assesses the approach to product development and delivery that emphasizes differentiation, functionality, methodology and feature set as they map to current and future requirements. Including, but not limited to, mobile device management, unified endpoint management, self-service capabilities, Mac management, server management, virtualization support, integration and security. Business Model: This criterion covers the strategic nature of the vendor's CMT business, how important it is to the vendor's overall success, and whether its CMT business is structured, staffed and funded adequately to succeed. Geographic Strategy: This assesses the vendor's strategy to direct CMT resources, skills and offerings to meet the specific needs of geographies outside the "home" or native geography, either directly or through partners, channels and subsidiaries, as appropriate for that geography and market. They understand future organizational demands for client and user management. They have the ability to meet a diverse set of organizational requirements, especially those of large and mature enterprises. There is consistent positive feedback from clients regarding the value of their products and the overall service and support experiences. They have sustainable market share and financial health. They demonstrate ongoing visibility and deal success in the client management market (Gartner tracks how often vendors are being considered by organizations as a measure of visibility). They have the ability to service global clients, or have demonstrated the ability to deliver and support solutions to customers in North America, Europe and Asia. The vendors in the Leaders quadrant have unique characteristics that position them favorably for future market success. Challengers are defined by keen capabilities related to the Ability to Execute criteria; however, when compared with competitors, they lag behind in delivering new and evolving capabilities, they are slow to market with new functionality or lack complete functionality, or they have comparatively few visionary features, particularly around emerging requirements to manage beyond traditional Windows PCs. This, along with the ability to support new management paradigms, is viewed as necessary to shape the future of the market. Their ability to execute will be proved by solid market share and overall strong functionality. These capabilities are bolstered by overall industry-leading fiscal health and broad geographic presence. Visionaries are defined by keen capabilities related to the Completeness of Vision criteria. Visionaries have scores that reflect feature-complete products, and show technology leadership in providing differentiated or unique management functions that users have begun requesting, or that will have an impact during the next few years. A Visionary has a strong vision for unified endpoint management and may have particular strengths in certain emerging areas, but may lack a fully mature life cycle management solution, global market presence, brand recognition and/or large enterprise capabilities. Niche Players can be good choices. They may have strengths in particular areas, but don't have the resources to invest in all the requirements we evaluate for the Completeness of Vision criteria or have chosen to narrow the scope of their offering to better serve core constituencies. Organizations looking for products with specific strengths, or looking for only a subset of capabilities, may find that Niche Players offer sufficient capabilities and support. Niche Players often target specific segments or geographies, are new to the market, or sell their CMTs into their own installed base, rather than consistently as stand-alone solutions. Organizations should not merely choose from vendors in the Leaders quadrant; they should create a list of criteria that describes their needs, and select from vendors that best meet those requirements. Organizations should use a vendor that can meet their specific needs for at least the next three years. Strong focus should be placed on skills, training, process and proper product implementation, because these factors will influence an organization's product experience more than the specific functional capabilities. CMTs are widely used in both midsize and large enterprises, although there is great variability in the extent to which their capabilities are being utilized. For many organizations, they remain the primary means to reduce cost of ownership, improve user productivity, increase IT efficiency and help enable a secure client computing environment. Despite being a highly mature technology market, changes in the mobile and endpoint computing landscape are forcing CMT vendors to continually innovate and evolve their products to address new requirements. A new generation of user requires IT to deliver and manage services in new ways. Bring your own device (BYOD), mobility, user personal cloud and digital workplace programs continue to grow in popularity, and are forcing CMTs to evolve to support these initiatives. Self-service — The ability of CMTs to deliver self-service capabilities continues to grow in importance as organizations look to enhance the management experience for the user, improve the efficiency with which software and services are delivered, increase user productivity and satisfaction, and lower total cost of ownership. Most CMTs offer some form of basic self-service capabilities, but only a handful provide workflow and automation capabilities out of the box — most require additional modules or service desk tools. Self-service capabilities are increasingly becoming a leading area of differentiation. Patch management — Security and compliance remains a critical focus for most organizations, increasing the need for strong patch management. All CMTs provide patch management capabilities, but there is great variability from one tool to another. Some offer only basic functionality for patching the operating system, while others are more sophisticated in both the breadth of operating systems and applications that they patch, as well as the level of functionality, automation and reporting they provide. Patching is commonly the initial use case for CMTs, and often the primary justification for selecting one tool over another. Unified endpoint management — Organizations are struggling to manage a growing number of smartphones, tablets and BYOD devices connecting to their networks. Even though CMTs are beginning to offer basic functionality to manage these devices, most organizations continue to utilize separate EMM products, often from different vendors. We are toward approaching the beginning of Wave 2 of unified endpoint management (see "Managing PCs, Smartphones and Tablets and the Future Ahead"), where a single product initially using separate processes will manage both traditional clients and mobile devices. As such, it is critical that organizations understand their CMT vendor's ability to manage mobile devices today and their plans for convergence. Security and compliance — Rapidly changing security and compliance requirements being put in place by organizations are forcing CMTs to continually evolve their capabilities beyond just patch management. IT managers are increasingly looking for CMTs to help in automating the creation and enforcement of security standards on policies. This includes the use of security templates and compliance baselines, proactive notification of noncompliance and threats, and automatic remediation and advanced reporting of systems out of compliance. Security and compliance enhancements will continue to be a major area of focus of innovation for all CMT vendors. Client management is sometimes sold as an add-on module to another more strategic product (e.g., service desk). In this case, the CMT may not be as feature-rich as other stand-alone offerings in the market, but it does provide tight integration into other products in the vendor's portfolio. Client management is not usually strategic to the vendor's success. Client management functionality may also be delivered as part of a bundled offering where it acts as core function within a larger overall management suite. These offerings are typically targeted at the midmarket and designed for ease of use. Client management functionality is optimized to work specifically with other components of the same suite. Most often, CMTs are sold as stand-alone offerings and are a primary focus and investment area of the vendor, and strategic to its overall success. CMTs that are sold stand-alone are generally the most robust in breadth and depth of functionality, and provide strong integration capabilities with other products in the market. Understanding why a vendor competes in the market provides insight into the strategic nature of CMTs within a broader product set, the level of potential investments the vendor will make and how best to approach negotiations with that vendor. Vendors will claim to be able to address all segments of the market, but that is not the case. CMTs are almost always designed and optimized for a specific set of user requirements. There are always trade-offs that need to be made when designing a product or adding new features that will help in one segment, but negatively impact another. For example, providing deep functionality to manage a large number of devices — an enterprise requirement — almost always comes at the expense of ease of use — an SMB requirement. No CMT today can meet the general user requirements of all organizations. Service and support, presales and postsales activities, and go to market should also be aligned with the target market of the product. An enterprise-class product delivered from a vendor with SMB capabilities, or vice versa, usually results in misaligned expectations and a poor overall experience. Client management is a mature market. Switching CMT vendors occurs rather infrequently, especially at large enterprises. This is because there are usually limited meaningful technical benefits in doing so, switching can be a significant effort and the migrations can be time-consuming. This is particularly true where processes have been developed around specific tools. The main reasons we find organizations moving from one vendor to another are because of dissatisfaction with the incumbent provider or to get better pricing. In the midmarket, switching vendors is more common and there are still many organizations with no CMTs in place, which makes it a focus area for all vendors and a highly competitive market.